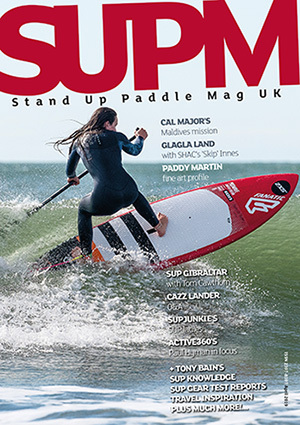 The recent emergence of stand up paddleboards has provided a platform for paddlers to experience both new and familiar waterways from a unique perspective. 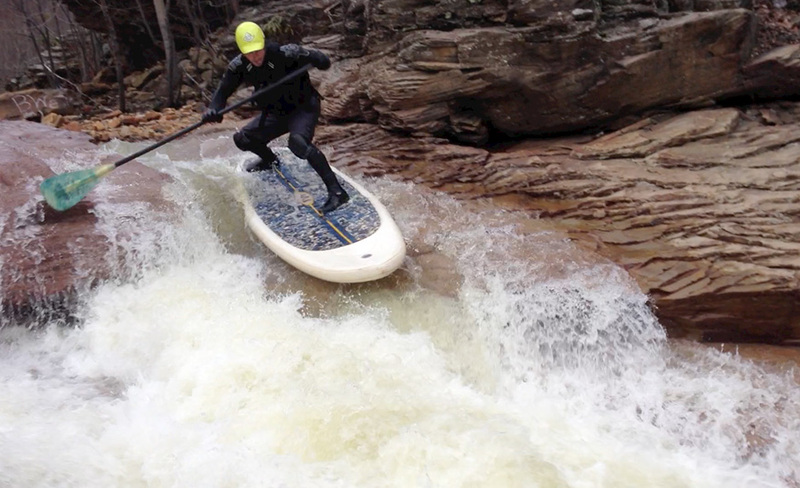 While some are exploring outer reefs or isolated surf breaks, others are making descents on the inconspicuous whitewater creeks that lie on the cusp of what is navigable. These small streams provide a challenging but incredibly rewarding playground for intrepid SUPers. This has also spurned the development of new tactics for negotiating rapids, waterfalls, and other obstacles on these liquid alleyways of the mountains. When Rob Mazzetti and I first obtained a paddleboard, our cumulative knowledge about whitewater consisted of roughly what you can learn on the bus briefing of a commercial rafting trip. 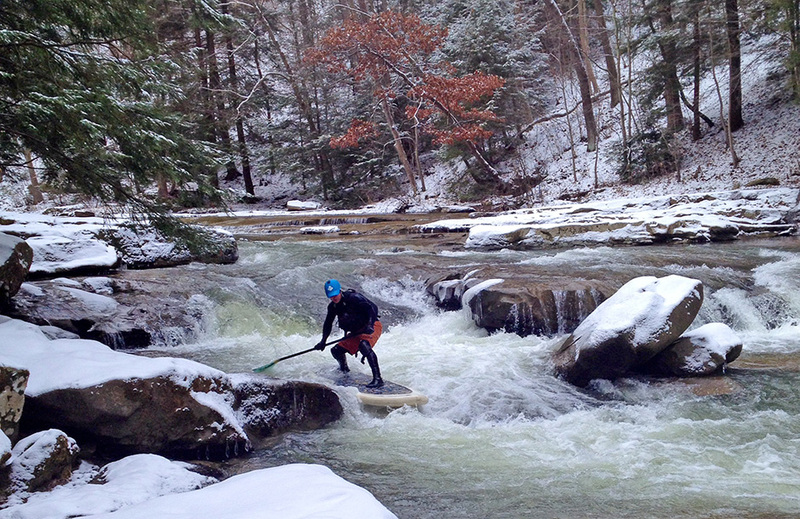 In spite of our less than spectacular credentials, we immediately strived to take the SUP board through rapids near our homes in Pennsylvania. Although most people we spoke to about our ambitions considered it irrational, to us it was a natural propensity. What could be better than surfing down a stream and exploring the canyons and gorges of our mountains from the freedom of a paddleboard? At the time, whitewater SUP was in its infancy. 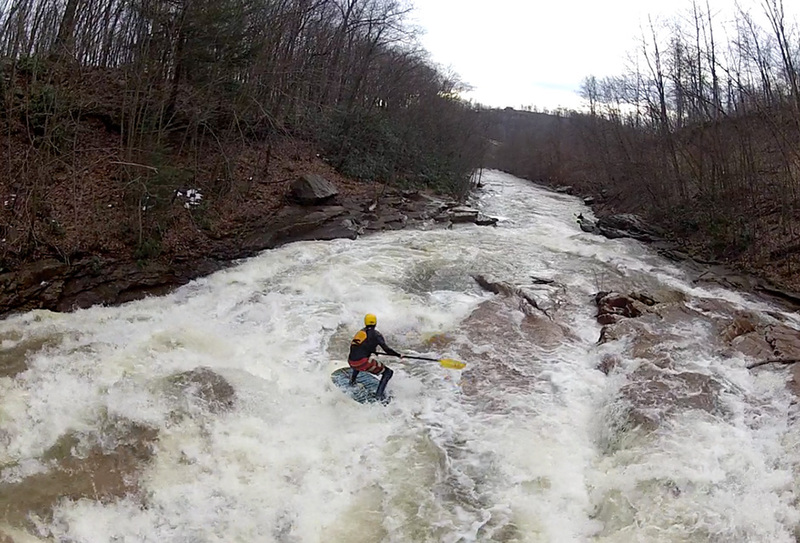 The only media we could find about the fledgling sport were a handful of videos from Corran Addison and Charlie MacArthur, most of which showed them paddling medium to high volume rivers that looked nothing like the rock-strewn, low-volume creeks we had set our sights on in Pennsylvania. Regardless, we found ourselves with our only paddleboard on the banks of a small Appalachian stream committed to the idea. When confronted with a new experience, I tend to be a calculated, often sceptical person and as we scouted the first rapid, I saw a minefield of looming disaster. A labyrinth of rocks and boulders, most covered by only a few inches of water lay before us. To make it through successfully would require connecting several manoeuvres with little room for error. The rapid was class-II, and drawing on my exhaustive whitewater acumen, I knew with certainty that a fall would be painful and possibly fatal. Fortunately, my friend and paddling partner, Rob Mazzetti, believes in a literal sense that he is capable of flying someday. No, not in an aircraft or mechanical suit of sorts, think Peter Pan. His understanding is that belief can extend the boundaries of physical capability and therefore, stand-up paddling through the rapids would be, in his words, “good to go.” And, of course, it was. We took turns running the rapid, learning from our mistakes and did so throughout the summer. My conservative approach combined with Rob’s innovative manifestations landed us somewhere in between, allowing us to stay safe while exploring our limits and developing tactics to overcome the difficulties we encountered. Initially, one of our biggest obstacles in paddling low-volume whitewater creeks was striking the fins of the board on shallow rocks. The most common result was ‘super-manning’ face first into the stream, usually followed by a painful swim through the rest of the rapid. Fortunately, Rob was already thinking of ways to move past this hurdle. I had been paddling with a square-stance, feet side-by-side, but Rob realized that by transitioning to a crouching surf stance, he was able to punch the board forward by putting weight on the front foot, thereby reducing or eliminating the impact on the fins. 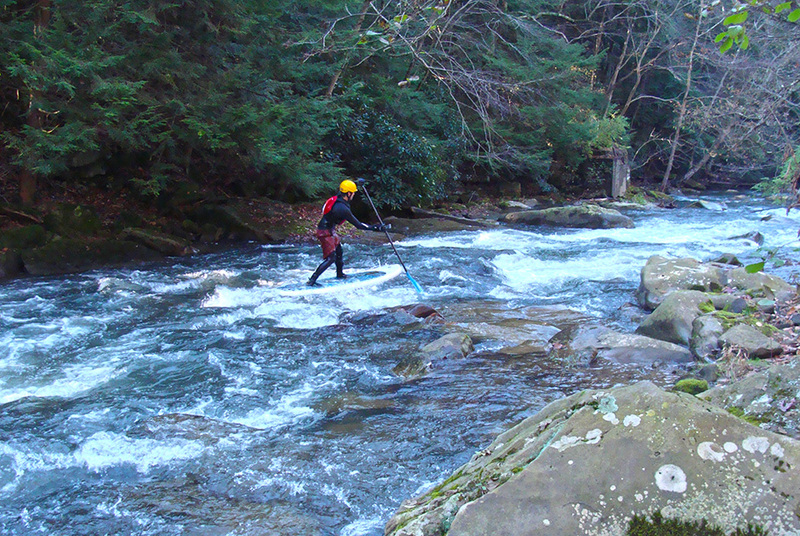 With the correct transition of weight from front to back, he converted low-flow rock collisions from disasters to manageable occurrences that have proven critical in nearly every creeking SUP run we now do. The enveloping lesson was to constantly move our feet to adjust for the characteristics of the water. Stagnancy in foot position invariably leads to instability and unpreparedness for obstacles. 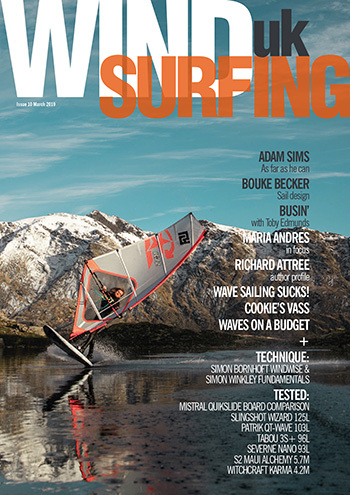 The concept of shifting weight to the extreme front and rear of the board opened the floodgates for new manoeuvres and methodology for running whitewater. 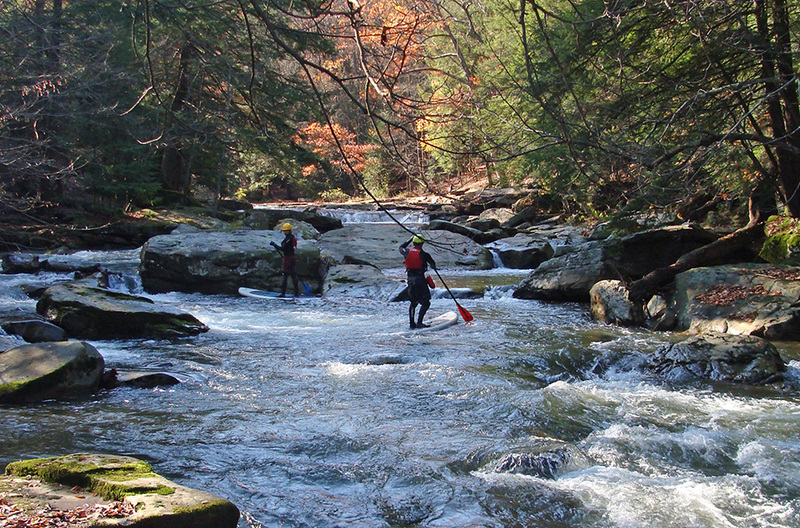 As we began running more difficult, steeper rapids, we adapted the stance and weight-shifting motion as a viable means of landing steeper drops. Even slides and waterfalls, we found, could be paddled with the fins still in place on the board. 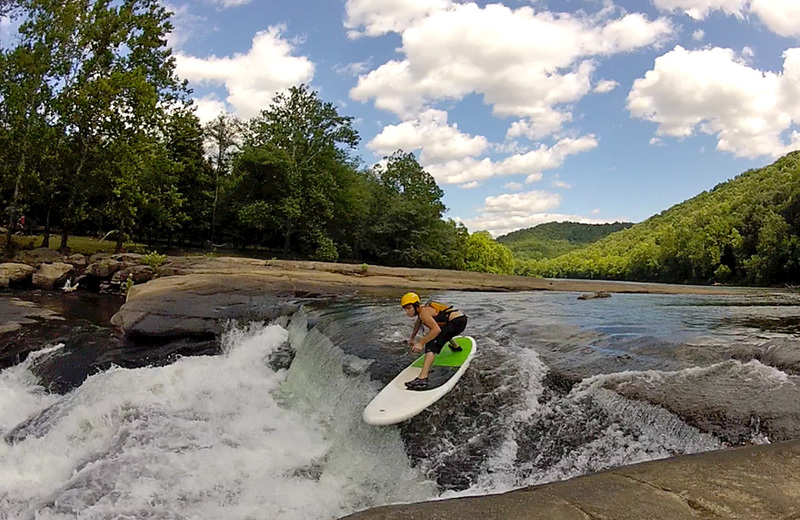 On a trip to the Youghiogheny River this tactic came to fruition when Rob was able to boof over the shallow lip of Swallow Tail Falls, a formidable six-foot vertical drop, landing flat and paddling away from the boil at the base of the falls effectively. “For waterfalls, I get low. The lower the better,” Rob states as one of his keys to successfully running waterfalls and steep drops. Additionally, we learned to favour quad-fin setups that allowed the board to pass over rock reefs, shallow waterfalls and slides without throwing off balance or getting the board stuck in most cases. Additionally, Rob emphasizes the importance of good paddling technique to ensure you can guide the board in the right direction at critical moments. “It’s very important to have your J-stroke or cross bow dialled in and second nature when charging into a rapid. People often forget to J-stroke right at the entrance to a rapid and get turned sideways and off line right away,” he explains. Another vital practice that we learned is keeping the paddle blade in the water. Hesitance is the worst possible state of mind when you are immersed in a rapid. Keep paddling and use bracing or feathering strokes to help maintain balance and make minute adjustments to your angle and line. “If you find yourself in a tricky current that is difficult to balance on, get low and keep your paddle behind you in the water and flat to give a nice brace,” Rob suggests. 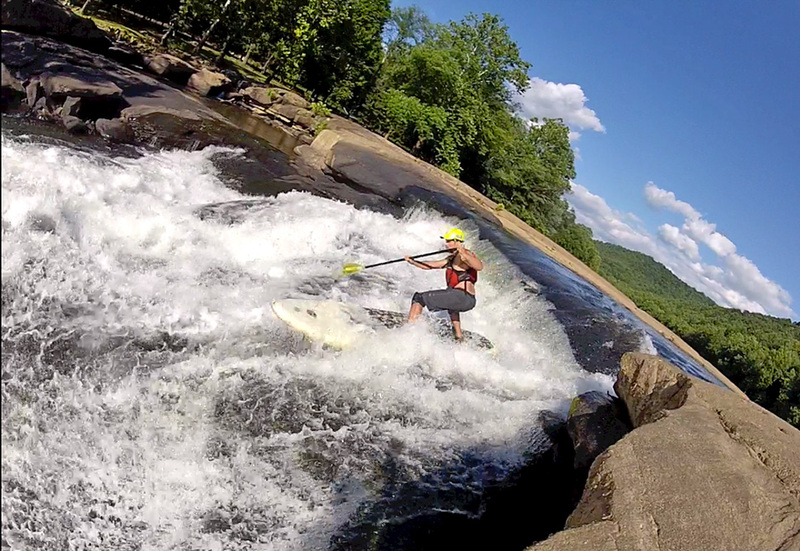 Another issue that is omnipresent in low-volume whitewater is the relentless pace of the current and the need to transition from one move to another while maintaining control. In the beginning, running rapids on our board meant taking the most direct line without catching eddies or ferrying in challenging spots. 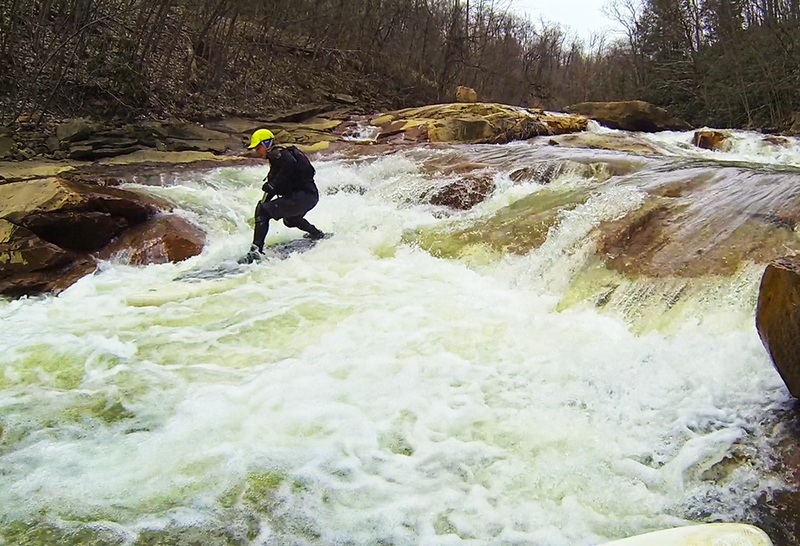 As our whitewater knowledge expanded, however, we realized that finding inconspicuous lines through a rapid and carving through them was a gratifying and ultimately more effective strategy. 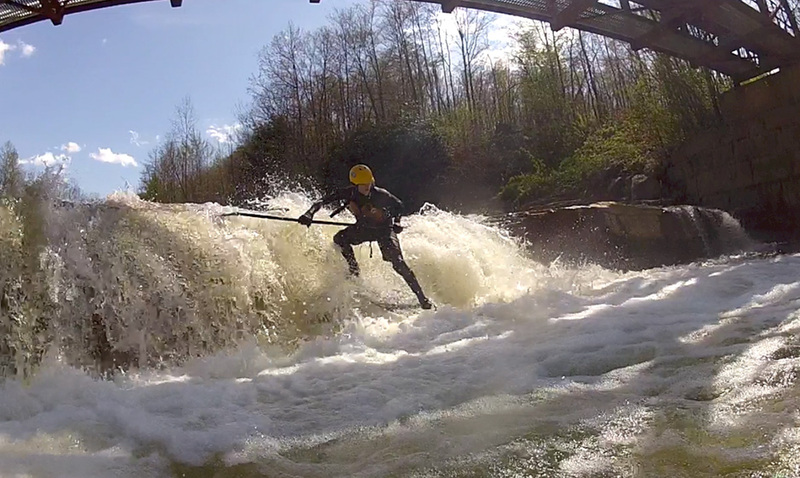 In difficult whitewater, we found these lines not just fun, but mandatory for safely making it through certain rapids. There are a few essential concepts for connecting moves in fast water while remaining upright. Shifting weight to the back foot and near the tail of the board allows you to pick up the nose and change direction in one fluid motion. You have to be careful not to submerge the tail too far and hit the bottom and also be ready to put weight on the front foot to regain your balance and paddling position. Being on the tail significantly reduces surface area and buoyancy so it is essential to do so in the least turbulent water possible. It is often necessary to make impromptu pivot turns in the middle of a complex rapid or immediately after landing a drop so learning to do so under a variety of conditions is essential. In the same way ice skaters, skiers and snowboarders use their edges to turn, stop, and control their movement; the rails of an SUP are equally valuable. Continuous whitewater demands that you are able to catch and escape small eddies and adjust your line in fast currents using upstream ferries. These skills require that you weight the downstream edge, lifting the upstream rail to allow water to pass underneath the board. The higher your speed, the more dramatically you have to lean into the rails to prevent the deck from getting swamped. Using the rails of the board is also effective for setting an appropriate angle for ferries and drops, squeezing through tight slots, and engaging radical turns. If you are staring at the water passing beneath you, you won’t be prepared to manoeuvre around obstacles that you are approaching. As you begin paddling more technical rapids, your eyes should be evaluating the river and anticipating several moves ahead, rather than what is beneath you. 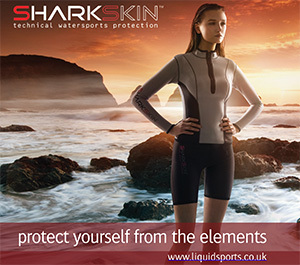 Feeling the water under your feet and adjusting your stance intuitively allows your eyes to stay ahead, scanning the movement of the water and planning your exact route. This also enables you to be aware of any unexpected hazards such as strainers or undercut rocks that are commonplace in narrow creeks and pose serious risk. If you identify something you need to avoid, immediately set your gaze on the safest alternative. If there is an eddy available, put your entire focus and power into catching it so you can evaluate the situation and alert any paddlers behind you of the danger. 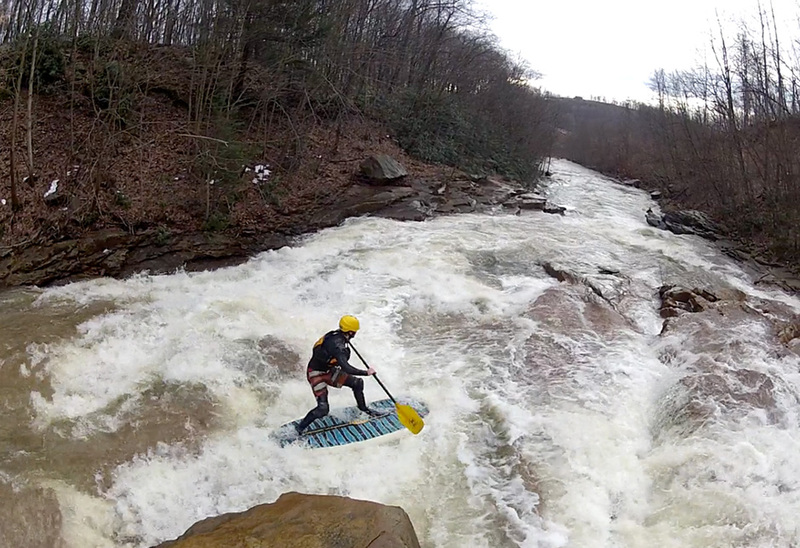 With these adaptations, we were able to take our boards on steeper and tighter streams with more technical rapids. With every section of stream we explored, new experiences moulded our ideas about how stand-up paddling on mountain streams could evolve. Rob started calling our backcountry adventures ‘Creek Surfing’ and, as we continued to expand on our unique relationship with stand-up paddling these diminutive but spectacular waterways, the title became more and more appropriate. Rob describes creek surfing as an intimate connection with the stream. It is not just making it through a rapid, but interacting with it and tapping into its energy. Whether it is squeezing through tiny slots where almost no other craft can go, or surfing standing waves in the solitude of mountain valleys, the freedom is impossible to deny. Sure, we could have learned to kayak or taken a canoe on our journeys. Instead, we chose a different path; one that we felt we could call our own, even if that meant injury, insult, and uncertainty. There are streams, rivers, and oceans all offering a canvas for stand-up paddlers to carve new lines and explore the frontiers that beckon our exploration. Nice article. It’s interesting you guys are using J Strokes. I’ve never found J Strokes to be very effective on a SUP. I think it’s because trying to correct the board at the end of a stroke is more difficult due to the fins being at the tail of the board. I’ve found bow draws before making a forward stroke to be the most effective and extremely efficient. It’s easier correct a turn at the beginning of the stroke because there are no fins at the nose, and it seems to keep the board going straight vs turning and correcting. This combined with good overall paddle technique is what gets me down rapids.